Coming home from another drubbing at the hands of a hated enemy, I was scrolling through my new iPhone, looking for something suitable to ease the pain. Midlake? Far too minor key. Hot Chip? Too cheery. Mark Eitzel? That’ll do nicely. There’s something in his tone of voice; that soft, gentle warmth that envelops you even as he’s singing about how he’s been drinking too much and he’s down on his luck and all that. Just what you need when you’re hacked off spending a grand a year watching a bunch of overpaid tossers fanny about. 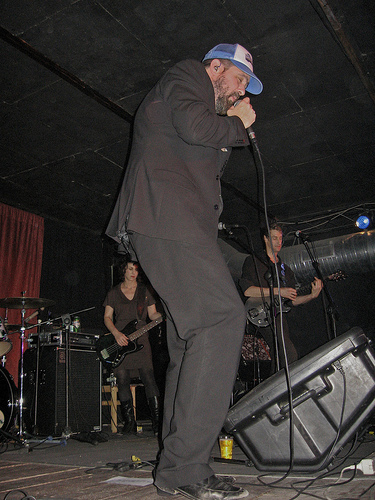 Speaking of pay, I read an interview with the charming Mr Eitzel toward the end of last year in which he stated that he was pretty much bankrupt; couldn’t afford to tour with a full band and was living from one month to the next. So, in honour of one of the finest singer/songwriters the US has produced, please listen to the song below and then go and buy the album from which it comes (“Klamath”). You can have it autographed and everything. Happy birthday to you, happy birthday to you, happy birthday Maaarrrrkiiiieeee, happy birthday to you. Or buy “Klamath” from Amazon here.